Imagine being sent to your room because your mother calls you a wild thing. When you get there, you turn your anger into a creative adventure using your imagination. Suddenly, your bedroom is magically changing into another world. You are thrust into a world of wild things where you are crowned king. This is the premise of Maurice Sendak’s 1964 Caldecott Medal winning book. For over forty years this book has been a classic that generations of parents and grandparents have shared with children. I still remember hearing this book on tape (perhaps record) in the library of my elementary school. Back in those days (early 80’s), we were thrilled that it came with a (*gasp*) film strip of the illustrations. Each time the little beep sounded, the librarian would move to the next exciting picture of Max on his adventure with the Wild Things. On Friday, October 16th, Where the Wild Things Are: The IMAX Experience opened. Now you can take a special child in your life, or treat the child within to this new version of a 40 year old classic on film. To help and celebrate the release, IMAX is going to be starting a promotion just for their Facebook fans on Monday, October 19th. Each day of that week, two lucky fans who put the Where the Wild Things Are crown on their profile picture and comment on the IMAX Wall will be entered to win an exclusive IMAX Where the Wild Things Are poster, book, and a pair of IMAX movie tickets! The crown image and full intructions will be released on the IMAX Fan Page on Monday. Thanks to Momfluence, I have an additional opportunity to offer my readers. Please note: The contest ends Friday, October 23rd at 11:59 p.m. ET and is open to all legal U.S. residents age 18 years or older. If you are on Twitter, please be aware that there will also be a Twitter party for this event – hashtag #IMAXWildThings – Monday from 9 to 10 p.m. ET. Even more prizes and tickets will be awarded during this time. 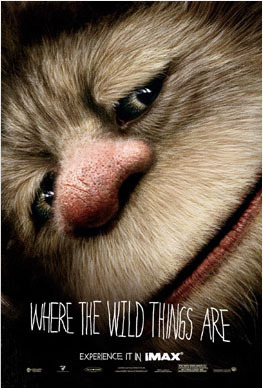 I know that I will be reading the book Where the Wild Things Are to both of my boys. With any luck, we will also take my six year old son to see the IMAX movie as a special treat in the next week. As a parent, teacher and kid at heart I look forward to seeing Sendak’s classic up on the big screen. Good luck to all those that enter the two contests! Disclosure: As a Momfluence member, I was asked to help spread the word about the release of the IMAX Where the Wild Things Are movie and two related contests. I received no compensation for this post. As a bonus, I will be entered to possibly win a Momfluence blogger prize pack like the one being given away.